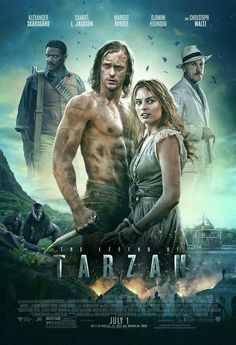 Brief Synopsis – After starting his new life in England, Tarzan is sent by the government to return to the jungles of Africa to help ensure peace. My Take on it – I had hoped that this would be a return to form for the character of Tarzan but instead was treated to poorly done carbon copy of The Last of the Mohicans (1992). The plot is too strange and convoluted and leads things in circles instead of in a straight line. Nothing feels unique and original. The characters all feel like typical Hollywood stereotypes. Even with some great actors involved in this film, none of them manage to give a memorable perfornance. Basically, stay far away from this mess. Bottom Line – Complete waste of time. Feels too much like a poor carbon copy of The Last of the Mohicans (1992) instead of an original story about Tarzan returning to the jungle. The plot is very strange and the characters all feel like typical Hollywood stereotypes across the board with no originality in sight. None of the actors are memorable in these roles.